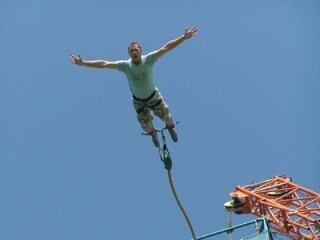 Take the plunge in style, with a brilliant 160 foot Bungee Jump in Brighton. See a seagull's-eye view of Brighton before making a seriously exciting leap of faith! 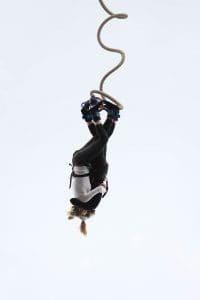 Brave the bounce with a Brighton bungee jump! There's always plenty of fun to be had in Brighton, but when bungee comes to town, things get that bit more extreme... The Brighton bungee jump is located at Brighton Marina and Brighton Beach Front, giving jumpers a real treat - the views of the southern coast from your 160ft bungee platform are really gorgeous. Be careful, however, not to get overly caught up in the lovely views, as you'll want to keep your mind focused on the reason you're standing on a 160ft high platform - to jump off it! The location at Brighton Marina not only means that there is lots of free car parking for jumpers (and spectators), but also that the bungee jump can be part of a really lovely day out. The Marina has plenty of restaurants, cafés and pubs where you can go for a bite to eat, and if the sun is shining you are right beside the beach. The beach-front location will give you spectacular views over the sea and promenade...who doesn't love to be beside the seaside?! When you get to the bungee centre you will complete a registration form, then be carefully weighed by the crew, who will allocate you the perfect bungee cord for your jump. Then it's time to get fitted in your harness, which will be double- and triple-checked, to ensure absolutely everything is as it should be for your bungee jump. You'll then get in the 'hot seat', and be left in the very capable hands of the experienced jumpmaster. With your ankle harnesses properly fitted and some final safety check being completed, up goes the jump cage to it's 160 foot high destination. Take a moment or two to savour the seagull's eye view of Brighton, before you hear the jumpmaster's familiar call, then it's 3,2,1, Bungee! You have the option to buy a personalised DVD or merchandise on the day to remember your experience with. 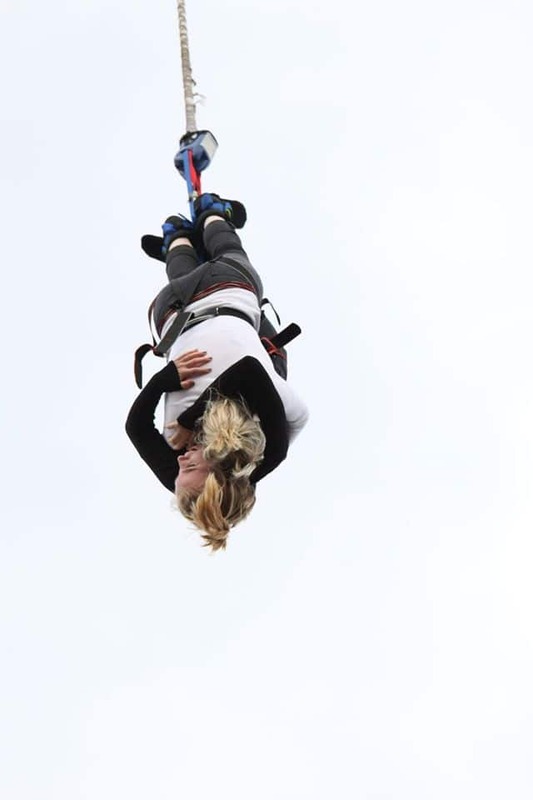 The Brighton Bungee Jump can be booked for one or two weekends throughout the year (subject to availability). Those over 50 years old will need a signed and stamped doctor's cert to jump. You must be in good health, and please make the centre aware of any medical conditions that you think may affect you being able to jump. You should aim to arrive approximately 30 minutes before your allocated time. The jump itself could take up to 10 minutes - including the cage ride up, in the crane. 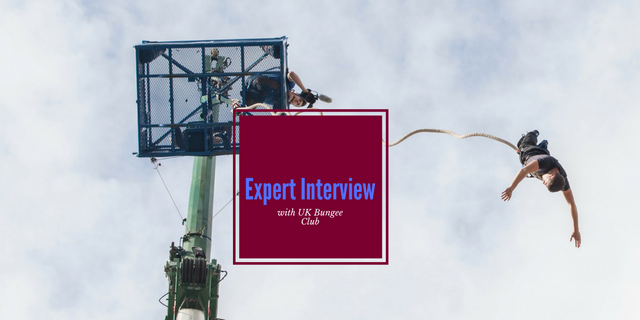 Participants: The Brighton Bungee Jumping is for 1 participant. Spectators are actively encouraged to attend and watch the bungee fun! Both Brighton locations have plenty to offer, so this experience can be part of a really lovely day out on the beautiful south coast. Participants jump one at a time, or in tandem. Casual and comfortable clothes are best, with trainers or flat soled shoes. Boots that might interfere with the ankle harness may have to be removed. Please remember that glasses and contact lenses MUST be removed prior to jumping, along with any loose jewellery. On rare occasions, extreme weather conditions such as very high winds may cause the jump to be cancelled. If you are in any doubt, please contact the centre on the day of, or the day before, your jump. 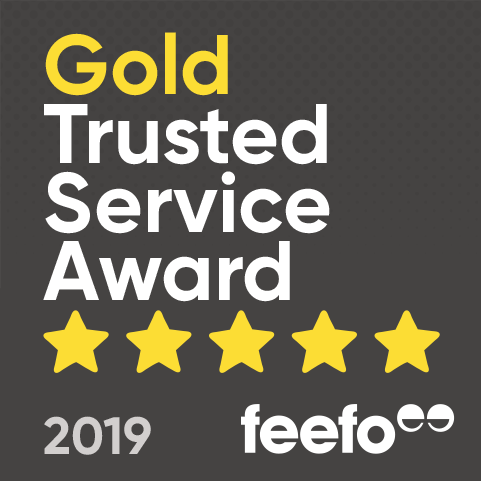 Had an excellent time, staff was friendly and helpful. Literally did not feel 160ft was that high until I was up there about to jump.!! I cannot fault my experience, the location was easy. Staff was really nice, welcoming and easy to talk to. Definitely going back! So much fun! A little scary jumping so close to the water, but a great view! Having always wanted to Bungee jump, (pretty much my whole life) but never had the chance - I really couldn't have been more excited. Upon arriving, the bungee staff were great fun and made everyone feel completely at ease...even those who were nervous. Standing with my toes over the edge of the cage, preparing to jump, the nerves set in, but the second they said "3,2,1 Bungee" all fear dissolved & the rush of adrenaline set in - it's just a shame that the free-fall was over so quickly - bigger & better for me, next time! Awesome views though. AMAZING. I am so pleased I did it. I will never do it again, as I was so petrified, but it was the biggest rush and a great experience! Loved it! I've bungee jumped with you when it was set up on Hove Lawns - and now for two years running since the crane rocked up in the Marina. It's a great setting with seaside views - and as it was in the summer, a fantastic way to spend the afternoon! I recommend anyone try a bungee jump at least once - and if you get chance - as many times as possible! Falling backwards is much scarier - so the FAB (front and back) jump available here is ideal. 4.5 stars... reserving some improvement for the 400ft jump, which is next!! I did the bungee jump at Brighton Marina on the 29th June 2014. Felt very comfortable with all the staff and felt that health and safety was taken seriously. Dave the bungee instructor was supportive as well. Would recommend. Thanks! The only downside is once you have your harness on there's no organisation on queuing, as found out when waiting people decided to jump in who clearly had there harness put on after myself.instead of waiting for around 30-45 minutes we waited an hour and a half. When explained to one of your colleagues he just shrugged his shoulders.overall I had a great day and would definatly recommend this day out but a queing system should really be put in place to stop people arguing. 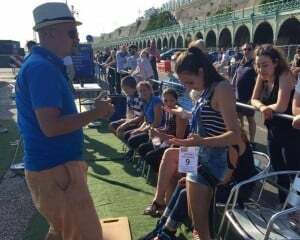 On Saturday 11th July, the Experience Days team met up with the UK Bungee Club for another unforgettable day of bungee jumping fun, right on the stunning Brighton beach-front. The weather could not have been more perfect, nor the views more crystal clear, but…as we know, bungee jumping is not about the weather, it’s about that rush of adrenaline. The bungee will be back in Brighton in September, so what are you waiting for?…get jumping – book your place, now!! When does this experience operate? This experience operates one or two weekends a year. Dates will be updated on the product page under 'Availability'. Otherwise, our customer service team will be happy to help with availability. How often is this experience held? The Brighton Bungee Jump is only held on two weekends a year. This means that availability is limited and you must book your experience in way in advance!